Oil prices are probably already high enough to spark a rebound in shale production. The IEA says that in the third quarter of 2016, the U.S. shale industry became cash flow neutral for the first time ever. That isn’t a typo. For years, the drilling boom was done with a lot of debt, and the revenues earned from steadily higher levels of output were not enough to cover the cost of drilling, even when oil prices traded above $100 per barrel in the go-go drilling days between 2011 and 2014. Even when U.S. oil production hit a peak at 9.7 million barrels per day in the second quarter of 2015, the industry did not break even. Indeed, shale companies were coming off of one of their worst quarters in terms of cash flow in recent history. That all changed around the middle of 2015 when the most indebted and high-cost producers went out of business and consolidation began to take hold. E&P companies began cutting costs, laying off workers, squeezing their suppliers and deferring projects that no longer made sense. By 2016, oil companies large and small had shed a lot of that extra fat, running leaner than at any point in the last few years. By the third quarter, oil prices had climbed back to above $40 and traded at around $50 per barrel for some time, replenishing some lost revenue. That was enough to make the industry cash flow neutral for the first time in its history. 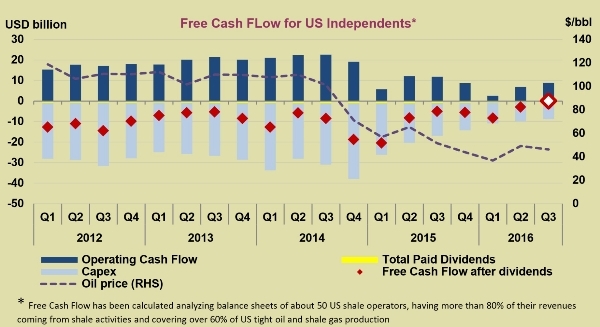 That suggests that moving forward, the shale industry could move into cash flow positive territory. Oil prices seem to be trading safely above $50 per barrel for the time being, and OPEC cuts could induce more price gains. The industry is now focusing on shale plays that have lower breakeven prices, namely, the Permian Basin and some parts of the Bakken. That has companies like Concho Resources, Murphy Oil, Devon Energy, Pioneer Natural Resources and EOG Resources all stepping up their spending levels heading into 2017. Wood Mackenzie suggests that $55 per barrel is a sweet spot for the oil and gas industry to rebound, a level that is only slightly above today’s prices. At $55 per barrel, the shale industry is cash flow positive and will grow accordingly. "If we stay (at $55 a barrel), the world's biggest oil companies start to make money again. If we go back down to $50 (or lower) in 2017...then those companies are in the negative territory and they go back into survival mode where they have been in the last two years," Angus Rodger, WoodMac’s research director for upstream oil and gas, said in a report. He estimates that OPEC’s cuts could succeed in pushing oil prices sustainably up to $55 per barrel. Even taking into account some cheating, WoodMac concludes that a 75 percent compliance rate with the promised cuts would get the markets to that price level. Still, the seeds of disappoint have already been sown – it is just a question of whether or not they will sprout. The U.S. dollar is at its strongest level in nearly a decade, which will weigh on global crude oil demand. Also, hedge funds and other money managers have staked out the most bullish position on oil futures in more than two years. That has succeeded in running up prices this month, but it also sets up the market for downside risk. Should data emerge in the coming months that some OPEC members are cheating, the net-long positions could unwind. Those liquidations tend to happen quickly, so a sharp fall in oil prices is not out of the question. "If confidence around the compliance with cuts wavers, the market will necessarily correct lower, considering that it also faces the twin headwinds of resilient U.S. production and a stronger dollar environment as the Fed begins to hike rates," Harry Tchilinguirian, an analyst with BNP Paribas, told S&P Global Platts. And while the financial markets present risk, the physical market is also up in the air. Of course, OPEC cheating is a possibility. But with U.S. shale producers already stepping up drilling, production could come back quicker than many expect. Weekly EIA data shows gains of nearly 300,000 bpd since the end of summer. On top of that, disrupted output from Libya and Nigeria – two countries not subjected to the OPEC cuts – could begin to come back. An oil tanker docked at Libya’s largest oil export terminal, Es Sider, this week, was the first tanker to load up Libyan oil from that terminal in more than two years. Libya hopes to add another 300,000 bpd in output in 2017 after adding as much in 2016. Even with those negative risks in mind, the shale industry is getting back to work. If oil prices can stay roughly where they are right now, the industry could become cash flow positive for the first time ever in 2017. Nick Cunningham is a writer for Oilprice.com where this originally appeared.